Sometimes the slow pace of a baseball game gets to me. My mind starts to wonder. Apparently I’m not the only one. 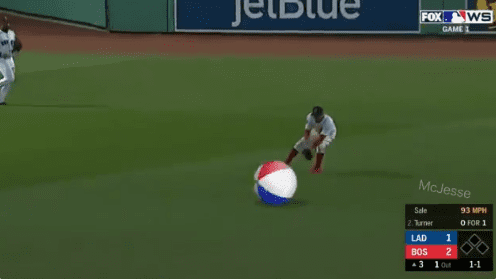 Somebody took footage of a Red Sox and Dodgers World Series game and replaced the baseball with a beach ball. I don’t know about you, but this does make the game a bit more interesting. Wonder how they would deal with the batter getting hit by the ball?